Extreame Savings Item! 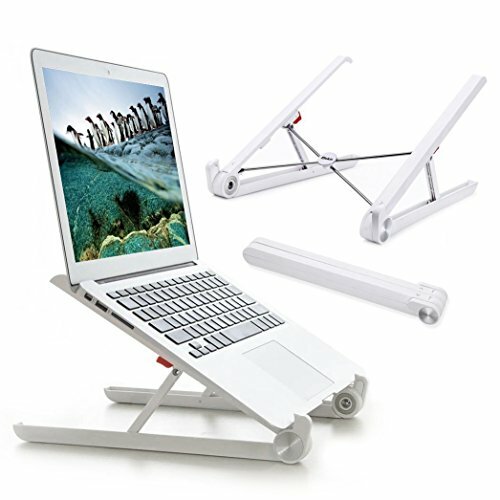 Save 44% on the Elekin Laptop Stand, Adjustable Stand for Desk, Macbook Stand Portable Light-weight Holder for Laptop/Notebook/Thinkpad/MacBook Pro/air, Foldable, Adjustable Height Width & Angle (White) by Elekin at The Daily Codex. MPN: NBZJ-22W. Hurry! Limited time offer. Offer valid only while supplies last. 【Ergonomic Laptop Stand】: If your cervical vertebra stoop long time, this posture will cause incurable spinal cord injury. Laptop stand is a good assistant to help you correct your posture. 【Stable Laptop Holder】: At the bottom of this laptop holder, there are silicone anti-skid pad, which prevent laptop from moving when you typing. It can bearing 25KG. 【Laptop Mounts' Quality】: Laptop stand is made of strengthened nylon, stainless steel and silicone materials, instead of plastic. It fits for most of laptop between 11-15.6"
【Light Weight & Portable】: Two level height adjust it from 26 to 30 degrees. This item will make your laptop elevated, ventilated, and you face the screen at the best angle. 【What You Get】: A laptop stand, 4 blockers, User manual, 18 month warranty, if you have any question, please feel free to contact us via email at any time. If you have any questions about this product by Elekin, contact us by completing and submitting the form below. If you are looking for a specif part number, please include it with your message.